Bern’s Steakhouse is located in the SOHO district of Tampa and was founded in 1956. The restaurant is popular with locals as well as celebrities such as Jon Cena and Nicole Bella of WWE and George W Bush ate at Bern’s twice during his presidency!! Bern’s has the largest wine list of any restaurant in the world and hosts an annual winefest, now in its 20th year! It was created to offer a unique food and wine experience, showcasing the area’s most talented culinary teams, complemented by the best wines from around the world. This is a super classy event and although there’s no dress code, you’ll want to dress to impress suitable for each event! The WINEFEST is an 8-day celebration and this year the event is April 23 – May 1st with different events each day! The events this year are Art, Bubbles and Bern’s on April 23, starting in the morning with a reception at EDGE where James Dalek will unveil a new mural and talk about the current art scene, followed by brunch in the garden terrace. During the brunch Bern’s will be unveiling its new wine with Chateau Ste Michelle, with guests being the first to try it! Executive Chef Chad Johnson and Chef de Cuisine Jonathan Atanacio will be preparing a FEAST to complement the wine. Tickets for this event are $150 and include complementary valet parking at the Epicurean Hotel. On April 24 is Bern’s Winefest Winemaker Dinner, featuring a five-course dinner by Chef de Cuisine Habteab Hamde and complemented by the LEGENDARY Australian Wines of Penfolds. The dinner will be hosted in the Bordeaux Room of Bern’s Steak house and attendees will receive a special gift! Tickets are $450 per person and include complementary parking at the Epicurean Hotel. Broadbent Madeira Tasting is on Tuesday, April 25th and is the first seminar of the week-long events celebrating Winefest. Wines for sampling include Rainwater, Verdelho 10 year, Serial 10 year, Boal 10 year, Malmsey 10 year and 1996 Colheita. The wines will be paired with delicious cheeses from the Bern’s Cave du Fromage and very special guest Bartholomew Broadbent will be there to present the wines! Tickets are $120 per person and again feature complimentary valet parking at the Epicurean Hotel. On Wednesday, April 26th Bern’s Steakhouse will be hosting the Chateau Palmer Bordeaux Dinner in the Bordeaux room. Chef de Cuisine Habteab Hamde will be creating a mouth-watering five-course dinner complimented by wines from Chateau Palmer. Tickers for the event are $525 per person and the reception starts at 6.30 followed by dinner at 7.15pm. Cigar City Supper Club also takes place on Wednesday, April 26th over at the Epicurean Hotel, owned by Bern’s and is a one of a kind interactive dinner, exploring the possibilities of pairing craft beer and modern cuisine. Wayne Wambles, Brewmaster of Cigar City Brewing will be presenting his award-winning beers including Legacy 1 and the highly sought after Hunahpu! Paired with the beers will be five courses prepared table side by chefs Courtney Orwig, Jonathan Atanacio and Chad Johnson. Tickets are $150 per person and the dress code is business casual. On Thursday evening, April 27th, the Epicurean Theatre plays host to the exclusive Champagne and Caviar Seminar, with Bern’s Steak House Executive Chef Hab Hamde and Sommelier Brad Dixon as well as guests from Champagne Krug and Sasanian Caviar Company. The seminar will feature four editions of Krug’s Grand Cuvee and will be paired with four luxury caviars and some unique small bites composed with caviar from Chef Hab. Dress code for this is business attire and tickets cost $150. The Haven Gala Winemaker Dinner will take place on Friday, April 28th at Haven restaurant with tickets at $350 per person. The dress code for this is upscale evening attire and will feature a six-course dinner featuring the wines of Chateau Ste. Special guests will include winemakers Raymon McKee and Jean-Francois Pellet and tickets include complementary valet parking at Haven Restaurant. Also on April 28th is Pappy Hour, a rare opportunity to explore a limited edition bourbon. Bourbons will include Berns’s Buffalo Trace, Van Winkle Special Reserve 12 year, Van Winkle Reserve Rye 13 year, Pappy Van Winkle Family Reserve 15 year, 20 year and 23 year. The event will take place at the Epicurean Hotel and tickets are $200 with complementary valet parking. The Epicurean Hotel will host Tablas Creek Wine Blending Seminar in the Theatre and Terrace on Saturday April 29th at 11am. The seminar includes a Tablas Creek Vineyard wine Sampling and picnic lunch which will be held in the garden terrace of the Epicurean Hotel. Tickets for the event are $160 and the dress code is picnic chic. Bern’s Legacy Dinner will take place that evening, April 29th with the reception at 6pm followed by dinner at 6.45. Tickets are $1200 per person and the five course dinner will feature selections from the Bern’s Cellar. This is the winefest’s most exclusive event! Come and chill out poolside in style at the Epicurean on Sunday April 29th for B6 – Bern’s, Bourbon, BBQ, Bubbles, Beer and Bull. B6 is going southern featuring the sounds of Stormbringer with both Bern’s Steak House and Haven showcasing their best BBQ creations. There will be a dozen bourbons, half a dozen champagnes and beers as well as TWO mechanical bulls. Tickets for the event are $130 per person. The Winefest VIP Party takes place at Haven Property on Sunday April 30th at 11am and tickets are $400 each. 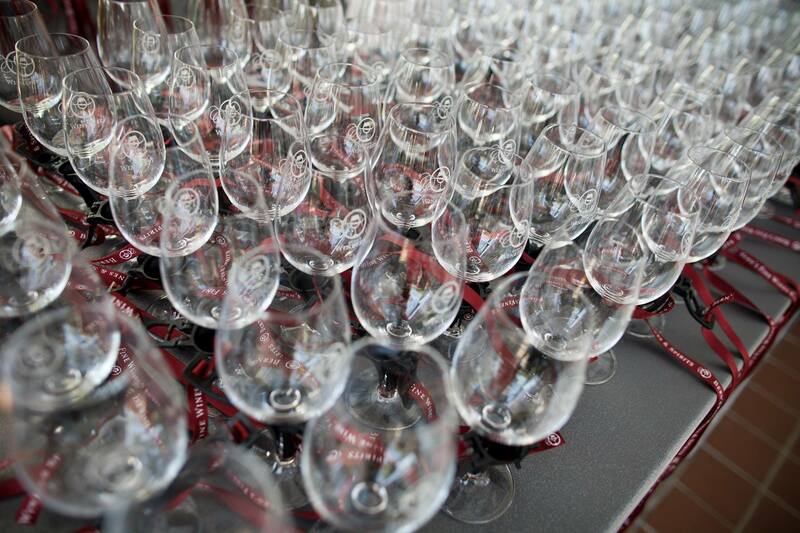 AT the VIP party you will taste your way through the grand tasting tents before general admission. Start early and enjoy the local food created by the culinary teams, without having to wait in line! The Grand Tasting is in a class of it’s own featuring over 200 top-rated wines paired with culinary dishes from Bern’s Steak House, Haven and the Epicurean Hotel. Lounge du Fromage and Chocolate Pi Patisserie provide the heavenly deserts and the event is a great way to spend the afternoon. Tickets are $175 per person and the event starts at 12.30pm. Make the most of your winefest experience with Wine Down at the Epicurean for $249 per person per night and stay in the heart of the action with no worrying about designating a driver.